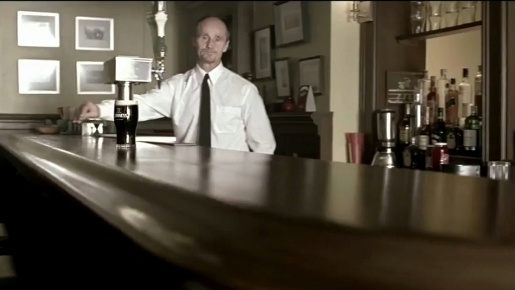 The legendary status of the freshly poured Guinness is celebrated in “Slide”, a television commercial spanning the bar and the workplace with a myriad of special effects. A fresh pint of Guinness is slid down a bar by a bartender. We then follow the pint down the end of the bar, out the bar and through city streets and offices. The Guinness arrives just in time to be drunk by “bold” employee who is in salary negotiations with his new boss. Filming was shot by director Craig Gillespie via MJZ with director of photography Emmanuel Chivo Lubezki. Editor was Kirk Baxter at Rock Paper Scissors. Music was produced at Bang Sound and Music by Loren Perkins. Visual Effects were produced at MassMarket by lead Flame artists Jamie Scott and Mark French.